There is nothing new under the sun. Here is the record of a discussion very similar to the many that have taken place in Ulster over the last thirty years. Some are speaking to the Saviour about a politically-motivated massacre of Galilæans by Pilate. Notice what He has to say in response the words of those who were speaking to Him and learn some lessons relevant to Omagh’s tragedy. I. THE WRONG PRESUMPTION MANY MAKE. These people were not slain by God in judgment or because the especially deserved to die. This is a common mistake. 1. Man makes many mistakes when contemplating eternal matters. Man is blind and in the dark. He is wrong about himself, his sin, the way of salvation and so much more. 2. He is never more wrong when trying to fathom the workings of God’s providence. Job 9:1-10; Rom 11:33. Omagh calls for a humble bowing before the wisdom and greatness of God and say: Shall not the Judge of all the earth do right? Gen 18:25. II. TROUBLE CAN COME TO ANY ONE OF US AT ANY TIME. 1. It came to the Galilæans while they worshipped. Verse 1. They were sacrificing when killed by Pilate. 2. It came to those of Siloam while they worked. Verse 4. 3. This being so we should live with eternity ever in mind. James 4:13-15, Ps 2:11. III. THE MOST IMPORTANT MATTER IS TO REPENT. That is what the Saviour underlined out of the two tragedies He referred to. 1. Repent is the gospel in one word. What an endorsing of this definition of the gospel we have from the Saviour. How false is a “gospel without repentance”. 3. The “perishing” of the body and soul in hell is far worse than the most horrible of deaths. Matt 10:28. Statement from the Free Presbyterian ministers in Co. Tyrone following the bombing of Omagh, issued on Saturday, 15th August at 10.30 p.m.
As ministers of the gospel of the Lord Jesus Christ, we offer our heart-felt sympathy to all those who sorrow and grieve over the loss of loved ones and all those who are suffering from injuries, inflicted by the cruel and wicked act of republican murderers in our county town of Omagh today. May the God of all mercy draw near to the broken-hearted and touch the broken bodies of those injured in hospital. We condemn the murderous action of those who planted the bomb and who planned the maximising of the slaughter by deliberately misleading the security forces as to the location of the bomb and thus ensuring that many had gathered in the area of the explosion. Such cunning displays a satanic cruelty, unmatched in the long period of Ulster’s terrorist troubles. We accuse our Government and in particular the Prime Minister, Tony Blair, and the Northern Ireland Secretary of State, Mo Mowlam, of pursuing a policy in Northern Ireland that has encouraged this atrocity and the many others that have gone before, by seeking to placate terrorism through immoral concessions such as the present early release of convicted terrorists. Yesterday’s murderous monsters have become today’s ministers-inwaiting! We have already heard words of condemnation from the lips of those politicians, who favour the release of convicted murderers and bombers, that are but an echo of the words employed to condemn the actions of those terrorists they are now determined to release. 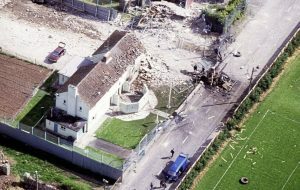 Let the people of Ulster remember that, had this bombing taken place two or three years ago, the perpetrators of today’s atrocity in Omagh (if indeed they had been convicted and jailed) would now be on the list of republicans due for release under the terms of the “Peace Agreement.” The politicians who have supported the present policy of appeasement that underwrites the “Peace Agreement” cannot escape having blood on their hands after today’s evil. We would earnestly seek to warn the Protestant people not to be swept further from the teaching of the Bible by the wave of ecumenical propaganda that has already begun in the wake of the bombing. Surely by now we must see that more of the same evil medicine that has brought such depravity on to our streets cannot possibly cure it! For over thirty years, we have been told that the abandonment of the Biblical creeds of the Protestant Reformation is the way forward to harmony and peace. Rather it has been the way that has led our Province into judgment. A return to God’s Word, rather than greater abandonment of it, is the way to peace and safety. We call on all who love Christ in truth to humble themselves before God and pray for a spiritual awakening to be granted to this land. Perhaps, as the afflictions wrought upon the Israelites by the Midianites promoted repentance and a seeking of God and ultimately a return to obedience by Israel with its consequent blessings for the nation, the evil of this day’s tragedy will bring home to us all the need for a seeking of God with the whole heart. If my people, which are called by my name, shall humble themselves, and pray, and seek my face, and turn from their wicked ways; then will I hear from heaven, and will forgive their sin, and will heal their land, 2 Chronicles 7:14. There are times when the finger must be pointed and the lie exposed. The cause of truth in a time of deception demands that a most vigorous witness be maintained. When there is a babble of voices proclaiming the lie the servant of God must be all the more strident in order to ensure that his voice rises above the lie. We live in just such a day. The fabric of national life is riddled with the woodworm of deception and falsehood. Politics, religion, business, every strata of the nation’s affairs is corrupted by untruths. A great deception is being wrought especially upon the Ulster people in the realm of religion and the constitutional future of our province. 1. It is deceitful to claim that no deal has been done with the IRA. I say that on the basis of the past history of London’s dealing with us. There has not been a prime minister or secretary of state but has lied about us and to us. Deals have been done with the IRA before in Whitelaw’s time and again just recently by Major’s government. Both deals were strenuously denied at the time. I find no comfort in the assurances of Archbishop Eames. He is a perjurer par excellence. As a minister of the Church of Ireland he has broken his ordination oath repeatedly by his affiliations with Rome. His word is no bond. I say it on the basis of the informed opinions of very many people. The press is filled with reports from those who have the inside track on such issues that indicates a deal. I say it on the basis of the activities since the cease-fire was declared. They confirm the reports of the contents of the deal struck between Major and the IRA. Prisoners brought over to Ulster, IRA armed escape, in which a prison officer was shot and wounded, but which was deemed no breach of a ‘cease-fire’, army reducing its presence, border roads being opened. Newsletter reports – 10/9/94. 2. It is deceitful to say that the IRA cease-fire forms the basis of future peace. A ceasing of terrorism is not the same as peace. Maybe if that was better understood there might not be the foolish tendency to swallow all the hyperbole uttered by the horde of deceivers that sit behind the microphones in the studios of the broadcasting media. I wish to speak about the true nature and character of peace. I. TRUE PEACE IS FOUND ONLY WHERE CHRIST IS OBEYED. Lev 26:6. Peace was promised to Israel when she obeyed the Word of God. While there is a continuing of the rejection of God’s word that we witness today, there can be no peace in Ulster. The word peace means— safety, quiet, tranquillity, contentment. Do you see any of those characteristics braking out on the Falls or Shankill roads? 1. The disturber of peace is sin. The harmony, tranquillity and contentment of heaven was disturbed by Satan’s sin, II Peter 2:4. Sin ruined the peace of man in the Garden of Eden, “Wherefore, as by one man sin entered into the world, and death by sin; and so death passed upon all men, for that all have sinned,” Romans 5:12. 2. As long as sin rules in the heart there will be rebellion in the life and behaviour of men. “For as he thinketh in his heart, so is he,” Pro 23:7. Isaiah 57:20-21. The word ‘rest’ means peace, Joshua 11:23. For peace to prevail there must be obedience to God. 3. Obedience of the gospel is the first peaceable act man will perform. True obedience is accompanied by surrender to Christ, a yielding up of all arms and resistance. The gospel is God’s peace terms, Isaiah 1:18. II. TRUE PEACE FLOURISHES ONLY WHERE CHRIST REIGNS. Psalm 72:7. In the day of Christ peace shall abundantly flourish. The day spoken of here is a specific reference to the millennium reign of Christ upon the earth. But it is seen at least in part in that day when the sinner comes under the rule of Christ. 1. There is peace in the soul regarding the past. The pardon of all sins has brought peace. 2. There is peace in the soul regarding the present. Having God’s mercy rest upon you leaves you desiring no more. It is enough. 3. There is peace in the soul regarding the future. It is well with our souls. III. TRUE PEACE FLOWS ONLY FROM CALVARY. 1. The blood of the cross is the basis of all peace. The blood-shedding of Christ dealt with the source of the sinner’s unrest — his war with God, Rom 5:10. 2. Peace is bestowed by the application of the blood to the heart of the sinner. Reconciled by the blood. Home of the Israelite marked by blood escaped judgment. 3. It is maintained by recourse to its cleansing power. I John 1:7-9. The sins of believers are dealt with by the blood. “My little children, these things write I unto you, that ye sin not. And if any man sin, we have an advocate with the Father, Jesus Christ the righteous: and he is the propitiation for our sins: and not for ours only, but also for the sins of the whole world,” I John 2:1-2. It is to the blood we look and to it alone for deliverance from sin and the unrest and strife that it creates. This psalm has been called the poet’s version of the Genesis account of creation. The author is believed to be David most likely. One can well imagine the observations of nature set down in this psalm being noted by the shepherd boy on the hills of Bethlehem as he tended the flocks of his father. To the spiritually enlightened mind nature provides much instruction. The seasons of the year are nature’s evangelists. Nature cannot enlighten the mind in the knowledge of God however. This requires an act of regeneration by the Holy Ghost. What nature may do is to reveal the wonderful power and wisdom of God to a mind enlightened by the Holy Ghost. The Creator manages His Creation for the benefit of His creatures. A sight of this will bring forth songs of praise, verse 1. Our text is found in the verse 14. The verse commences with a very humbling truth. God causes the grass to grow. Such a common things as grass is formed and brought forth by God. It is not the work of man. He may plant and water and fertilize but he cannot make it to grow. Happy is the man that learns the lesson of the grass. In seeing his own weakness and God’s greatness he is brought to a place where he may learn an even greater lesson — the way of salvation. My text is the final phrase of the verse. He that is fed from the earth must have come from the earth. That is what the Bible teaches us regarding man. Gen 2:7. 1. Here is a truth that is fundamentally important. The origins of all things are set before us in the very first words of Holy Writ. How vital must be this truth if it is so presented to us. Man can never know himself or the purpose of his existence if he does not learn this truth. 2. Here is a truth man still rejects. Man refuses to accept the Genesis account of his origins and continues to seek to concoct a theory as to how he originated. 6000 years of searching have failed to produce an answer that can stand examination. Evolutionists claim to have found the answer but their view is so terribly flawed that they must constantly revise it in order to accommodate the contradictions and absurdities within their theory. 3. In rejecting this truth man rebels against his Creator. The rebellion we witness in society is a parallel to that in which man is engaged against the Lord. Children refuse the authority of their parents. Citizens refuse the authority of rulers. Men refuse the authority of God. II. EVERY HARVEST REMINDS MAN OF HIS DEPENDENCE UPON GOD. While man may refuse to acknowledge God he is nevertheless dependent upon Him. Man may have harnessed, in a very limited way, some of the powers of nature but he cannot control those powers. The hurricane, the flood, the drought and, above all, the growing of food testify to this fact. 1. God controls the harvest. He causeth the earth to bring forth. The earth will obey only the Creator. His voice alone can cause the earth to respond and put in motion all the chemical and biological changes that are required to bring forth growth. Man may fertilise but few ever wonder how that it produces the effect that it does. But more than the earth is at work in the harvest. What of the sun and the rain? What of the creatures such as worms whose actions aerate the soil? There are even guardians set over the harvest in the form of tiny insects which feed upon others that would damage crops. Farmers in California have learned that their poison sprays were doing more harm than good in that they killed far more beneficial insects than harmful ones. 2. The earth produces all man requires. Even the synthetic materials are the product of the harvest of the earth. Nylon, Rayon, etc. are by-products of the forests that perished in the great flood. There is nothing that man uses that does not come from the earth. He that lives off the earth must go the way of the earth. “Behold, this day I am going the way of all the earth,” Joshua 23:14. 1. Note the cycle of life. Spring, summer, harvest, winter. While all these seasons will come to us we do not know how long they will last. Some summers are long and some are short. We can swiftly move from summer to winter. 2. All the earth has a harvest. There is a harvest of the beneficial crops and of the weeds. Good men and evil men will face a reaping. “For we must all appear before the judgment seat of Christ; that every one may receive the things done in his body, according to that he hath done, whether it be good or bad,” II Cor 5:10. IV. EVERY HARVEST REMINDS MAN OF THE CROSS. 1. Christ the seed. Christ calls Himself the corn of wheat. John 12:24. He was the divine seed that was planted for the food of the soul. He was sown by His Father’s hand for the feeding of the souls of men. John 6:35, 48, 51. 2. He was planted in death. John 12:24. 3. He was raised as a harvest. Food for the soul is to be found upon the cross. As the trees of the Garden of Eden provided for Adam and Eve, so the cross provides for us. 4. He is free to all who will partake. “At that time Jesus went on the sabbath day through the corn; and his disciples were an hungred, and began to pluck the ears of corn, and to eat,” Matt 12:1. You walk amidst a gospel cornfield and have but to reach out and pluck the corn of life. May the Lord give you a hunger for Christ. 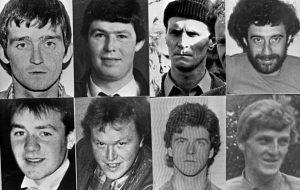 “A message for Protestants in the sermons preached by Roman Catholic priests at the funeral of IRA men shot by the SAS when they attacked Loughgall police station on May 8th, 1987.